Back Story: After three days of fasting and prayer by Mordecai, Susa Jews, and herself, Queen Esther robed herself in her best finery and went to the king court. King Xerxes was seated on his royal throne. When he saw Queen Esther he was pleased and held out his golden scepter, indicating she could approach him. Xerxes asked Esther her request. Esther responded by inviting King Xerxes and his chief advisor, Haman, to a banquet she prepared for them that day. At the banquet that Queen Esther gave King Xerxes and Haman, King Xerxes pressed the Queen to tell him her request. Again she demurred, but promised that if he and Haman would come to another banquet the next day, she would tell him her petition. Perhaps, Esther needed assurance that King Xerxes had enough interest in her to spend two evenings in a row in her company. At the second banquet that Esther gave for King Xerxes and Haman, Esther told King Xerxes about the plan to kill all Jews which included herself. She asked King Xerxes to spare her life and the lives of her people. When Xerxes asked what man would dare to make an attempt on the Queen’s life and the live of her people, Esther’s answered that Haman did this. King Xerxes was furious and walked into the garden to compose himself. Rather than going with King Xerxes, Haman remained inside the room with Esther, flaunting Persian rules for court behavior that no man except the king should be in the same room as a royal woman. Haman fell on Esther’s banquet couch to beg her to save his life just as King Xerxes reentered the room. Xerxes accused Haman of molesting the Queen and had him hung. 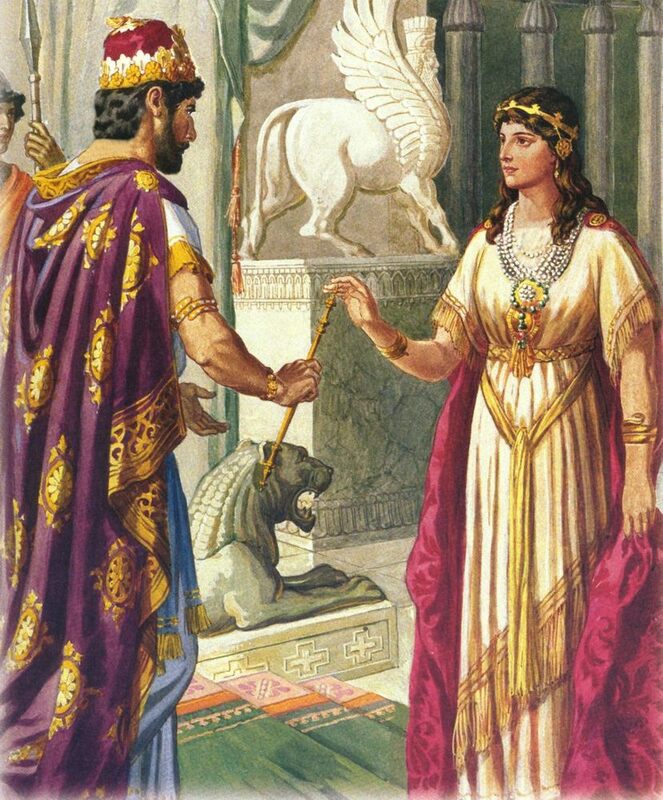 King Xerxes gave Haman’s estate to Queen Esther. In ancient Persia, it wasn’t unusual for a woman to own and manage estates as well as supervising household management and overseeing the harem. Pondering Relationships: Esther used both attraction and role power to entice King Xerxes to both banquets. During her three days of fasting and prayer, I believe Queen Esther “grew up” so to speak. She realized life wasn’t all about her and she had the power to save her people. Perhaps, Esther pondered Mordecai’s words to her that she was in the position of queen “for such a time as this” (Esther 4:14). During these three-to-five days in Esther’s life, she moved from a self-focused and possibly naïve girl who followed the instructions of men in her life to being the Queen of the mightiest Empire in the known world. Despite Esther’s decision to start thinking of others, i.e., the Jews in the Persian Empire, King Xerxes’s clear choice of her over Haman had to reinforce Esther’s thoughts and actions. Esther’s actions after the second banquet demonstrated her new maturity and determination to protect Jews in the Persian Empire. On her knees, she pleaded with King Xerxes to put an end to Haman’s plan to have all Jews murdered. In response King Xerxes wrote another edict which allowed Jews throughout the Empire to kill any armed forces that might attack them. In the city of Susa alone, the Jews killed 500 men including Haman’s 10 sons. Yet, this reinvented Queen wasn’t finished protecting her people. The day after the Jews struck down their enemies, Esther entered King Xerxes’s throne room. Again, King Xerxes vowed to give her whatever she wanted. Esther asked that the Jews in Susa be allowed an additional day to kill their enemies and to hang Haman’s ten sons where all could see them. The king concurred. With Esther’s agreement, Mordecai wrote a letter to Jews across the Persian Empire to direct them to celebrate annually the 14th and 15th days of Adair in remembrance of how the Jews got relief from their enemies. The name of the celebration was Purim which means “lot,” the way Haman determined the date for when the Jews would be killed. Reflection: What are some ways we can become less self-focused? List at least three concrete ways. Copyright: March 15, 2017; Carolyn A. Roth. All rights reserved. This entry was posted in Kings & Rulers and tagged Bible Study, Carolyn Roth Ministry, Haman the Horrible, King Xerxes, Lesser Known Bible Characters, Obscure Characters, Persian Empire, Queen Esther. Bookmark the permalink.